An American ex-pat in the UK blogging about life, culture and family. And then things turned dark. Or rather the leaves turned dark. And my teenage gardner was too sad for words. And so on Snapchat there was just a circle marking what we believed to be the end of Audrey 2. Rejoice! New life sprouting and Jesus similes on Snapchat. The Easter season is truly upon us! Last year on Easter Sunday, I visited my in-laws in Cambridge and went to their church. It was the first service of a newly merged congregation. And the minister that day spoke about what he said was one of the lessons of the Easter Story- that before there can be new life, there must be death. It seems such a simple, obvious lesson. But I tell you that day as I listened to the minister describing how the parishioners might feel grief at the loss of their individual communities even as they knew they were building something new and stronger together, I sobbed, and I honestly heard the Easter story in a whole new way. I felt the sadness of the death. And I cried. I cried for the loss of community I felt. I cried for everything I had given up in America in order to start my new life here in England. And more importantly, I gave myself permission to do so. Prior to that morning, I felt like it would be too ungrateful, too selfish to feel bad in any way for the things I left behind. After all, I chose to come here. I disrupted my children’s lives and the lives of those closest to us. And really what did I have to feel sad about? We are building a wonderful new life here. And yet, I did feel sad. I felt loss. And that’s okay. More than okay, it’s normal. 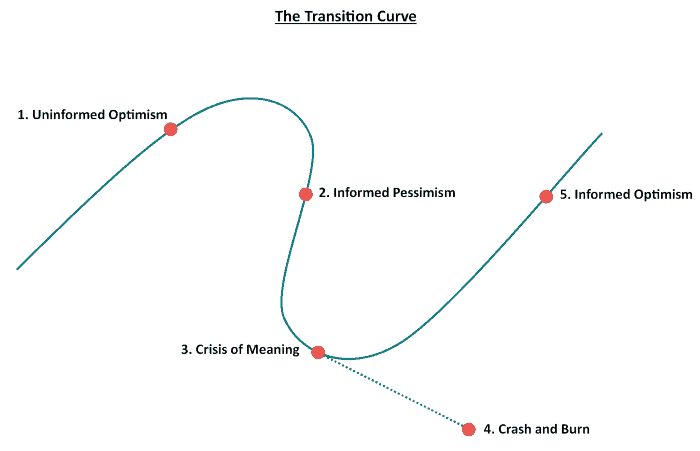 The trainer was explaining that all new business owners go through this transition curve. And again, the new business owner chose the path. They know what the happy ending looks like. And yet the transition will be hard. Because before new life, there must be death. Loss of old habits. Loss of old lifestyles. Loss of identity. And a crisis of meaning will come. And sometimes things don’t work out. Because even when everything points to success being just around the corner, sometimes at the crisis of meaning point, people start to doubt their path. Sometimes it just seems too hard. And sadly, sometimes not understanding that the grief is temporary can cause a crisis in faith that leads to a crash and burn. I hit a crisis of meaning point last year on Easter Sunday. And luckily for me, I heard the minister say that before there can be new life, there must be death. And I heard Jesus say it will be hard. “Why have you forsaken me?” And so I allowed myself to start to mourn. And luckily I’ve spent the last year on the upward curve of informed optimism. And so dear reader, if you are in a state of transition, even if it is one you willing threw yourself into, I know how you feel. You are not alone. And my Easter prayer for you is that you allow yourself to feel the loss and the grief. Accept that before new life, there must be death. And when the leaves start to darken, don’t give up. Keep tending the plant. And like Audrey 2 watch your new life grow stronger and taller than ever. In my last blog post, I mentioned one of the things I miss about America is the wide roads. Here I frequently find myself on narrow roads with little room for error on either side. One such road is on what Google Maps recommends as my shortest route home from work. Even though Manchester is a big city, this road is on the outskirts and looks like a winding country lane in the middle of nowhere. There are even cows in pastures in sight. And for a large stretch of the road, there are big trees lining both sides making it impossible to drive off the road without crashing into one. Last winter I navigated around that road because I was afraid to travel it in the dark. Even though it added about 10-15 minutes to my journey home, I went a different way. Because every time I needed to pass a car coming the other direction, I nearly had a panic attack. The few times I did try going that way in the dark, I remember gripping the wheel and sweating the whole way. I was terrified. Hence I started going the long way home. And then the days got longer until one day when it was no longer dark after work, I tried that route again. And even though the road was still narrow, in the light, it wasn’t as scary. And so I went that way. And I kept going that way even as the days have grown shorter. And now it is really dark again on my way home, but my panic is gone. I know that road now. Because I learned it in the light. This week as I was driving home on that road, I realized this is as dark as it’s going to get. Tomorrow is the shortest day of the year, and I will be traveling the shortest route home! This got me thinking about the Winter Solstice and metaphors and realities of darkness. The contrast in the length of the days here has given me a new appreciation for the changing seasons. Not just appreciation, an understanding in my bones. Last September I moved here to the latitude of 53.4808° N. And from the moment I arrived, the days started getting shorter. And by this time last year, (like now) there were only seven and half hours of daylight. And last year, I did find it all a bit oppressive. And cold. And endless. And the roads scary. And I forgot all my lessons about the solstice. I forgot that one day the days would get longer again. Mostly because in America, I hadn’t experienced such drastic differences in the length of the days. I knew intellectually there would be more light in summer, but I hadn’t yet physically experienced living here through the changing seasons. Now I have. Now I know that in the summer here, the days are gloriously long. Now I know that on the Summer Solstice, there will be an extra nine and a half hours of sunlight. So I am more okay this year. I can wait out the darkness. And I know after tomorrow, we are already on our way to the long days. To the days where the sunlight motivates you to stay out late. So now I should rest. Recharge. That’s the gift of winter. And reflecting on the physical realities of living through the dark times and light times, I am reminded of the strength of the metaphor too. That in times of darkness, we can rely on the changing seasons. This too shall pass. And if you practice the way enough times in the daylight, you can take the same route through the darkest of nights. For me, this means that when I am feeling good, I need to be my best self: eat right, exercise, be kind, be proactive, reflect and write, volunteer, reach out to people. All so those behaviors will be ingrained in me and sustained down dark lanes yet to come. So to anyone out there who might need reminding… there is always light over the horizon. To everything there is season. May you make the most of the darkness and the light. After living here for the past 15 months, I’m ready to present my initial findings. I’ve decided to start at the beginning. With the basics. Remember in elementary school when you had to make a presentation about another country? Or maybe, like me, you are a former Girl Scout with World Thinking Day experience? Following in those traditions, I will share today about the food, weather and language. And throw in a few fun facts for color. You might have thought my favorite thing about living here would have been being with my new husband. And that’s pretty nice, but honestly, no mosquitos is life changing. It means you can leave the windows open- with no screens! And outdoor activities and everyday leisure is unbelievably pleasant without those blood suckers. Here I am in the summer hiking near water with no bug bites in sight! 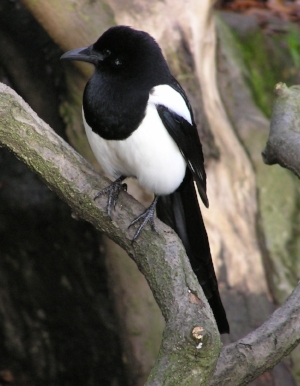 The second delightfully surprising thing about life in England is the abundance of magpies. Which let’s be honest, I thought were a nursery rhyme make-believe creature. But they are real. And all over the place. And I still smile every time I spot one. So the food here in England is pretty similar to America in many respects. Meat and potato countries that we are. The peas here might be mushy, and the bacon might be thick, but the biggest difference I’ve found is the way food is bought, kept, and prepared. Which is all to favor freshness. My fridge here is a 4th of the size of the one I had in America. Here we just shop frequently at stores within walking distance. And we make our bread crumbs from scratch. No report about England would be complete without throwing in a nod to the weather. It is rainy as advertised, but not in an oppressive way. The rain is usually light and passes quickly. Comes back quickly too, but then it goes again. And it never brings tornadoes. At least not that I know of… hail on the other hand, that does happen. But in general, it is calm and rainy and then mild and sunny. All without mosquitos. I like the non-extrerme weather here. I’m going to enjoy it while it lasts. It pained me a little to type color and favorite earlier in this blog post instead of colour and favourite. Because the language and the spelling here are seeping into my core bit by bit. Recently I said something about the way the sat nav took me home, and my husband commented on how I was “going native.” I said, “what do you mean?” “Well you wouldn’t say sat nav.” I had to be reminded what I would have said. GPS. There are some differences I still can’t take- football to me is the Steelers or OSU. I cannot call soccer football. During the World Cup and our office pool, my co-worker (or colleague for my English friends) said she was going to burn off a fingertip every time I said soccer instead of football. Not sure why she couldn’t just start with pinching… anyway. You can read some more vocabulary differences in my previous blog post. Or just wait for them to start bleeding through into my writing. One of the hardest things to get used to was the greeting people use around here (which might be a Manchester thing for all I know) of “you okay?” Several times I was quite indignant with my yes, why would you ask that? Because for me, you only ask if someone is okay if you think they might not be. But here, it is a greeting like, “how are you?” and the answer should be as perfunctory as “I’m fine, thanks.” I’m still working on my response. Another difference I’m struggling with is that it is somehow rude to address or refer to people who are in the room by pronouns instead of their name. This I learned at work. After several times being asked “who’s she, the cat’s mother?” I’m still shaking my head at that one. But mostly I’m glad that on most days, I am understood and I understand. Even if I would prefer my English mates to be a bit more direct. All except for my colleague who enforces the use of the word football, she’s plenty direct. And she has a name. Which I use when she’s in the room. As I hope you can see, there are many things I do love about my new homeland. But since I started this piece with my favourite things, I thought I’d end with some things I miss about life in America. Not counting people or specific places. Which I miss terribly. If you know me in real life, and we used to hang out, work, play, worship, or study together somewhere, I likely miss you and that place a great deal. But setting all that aside, what do I miss generically about life in America? Well truthfully after giving it a great deal of thought, here are the three things I miss most about life in America. Whether through nature or nurture, so much of who I am came from my Grandma Libby. I am so sorry to not be present for her today in body. I hope you all know I am present in spirit. And I want to thank all of you who took care of Grandma these last years of her life. Thank you for being there for her. You are all loved and appreciated. When I was around 20 I got my hair cut really short. My grandma Libby told me, “that is the ugliest haircut I’ve ever seen, and if anyone tells you different, they are lying to make you feel better.” I’m smiling even as I type this remembering that day. And so many others where my grandmother would just bluntly tell things as she saw them. There was little pretense. Just a genuine, honest assessment. My grandmother lived and spoke her truth. Always. To everyone. So to honor her, I would like to share some truths about her. She was a different kind of Grandmother from the tv grandma. She didn’t bake, or even cook. She never made dresses or even sewed on buttons. But she was the very best kind of grandmother- she was the kind of Grandmother who showed up. She was always present in our lives. At every important event, at every celebration, at every concert and sports game. And on lots of days in between. She took us on trips and played games with us. We knew we mattered to her. We knew she would do anything for us. Even tell us the truth about unflattering hair cuts when no one else would. Grandma would also embarrass us sometimes with her propensity for talking to everyone. I mean everyone. I don’t think I ever saw her walk past someone and not speak to them. And I don’t think I ever had a meal with her in a restaurant where she did not give an honest assessment of the food or the service. If you asked my grandma her opinion, you would get it. And sometimes even if you didn’t ask! Nothing about Grandma was fake. She did not sit on the sidelines of life. She participated fully. She volunteered with the Union. She took care of her neighbors. She spent time on the things she thought mattered. And she lived her truth. Even when it was difficult. And she loved us. And she loved my mom and my stepfather. Even though Grandma Libby was my dad’s mom. I was so young when my parents divorced that I have no real memories of them together, but I have tons and tons of memories of my mom and Grandma Libby together- I will be forever grateful for the relationship my paternal grandmother had with my mom. Their relationship helped define family for me. Which is so much bigger than blood. Grandma Libby was honest and blunt, but always kind and open. She made people feel comfortable and welcome at the party. She simply walked around with what she needed in her pockets, gathering experiences, looking at the view and talking to everyone. She didn’t pretend to be anything other than what she was and she didn’t hide what she thought. And I want to be just like her when I grow up. I heard a reporter say recently that he was looking forward to the graciousness Meghan Markle would bring to the royal family. He said Americans use and understand the word "gracious" more than the English do. I don't know if that is true, but as an American living in England, I am enjoying the positive press an American is getting. Walking my dog on the day of the Royal Wedding, I passed a house with a photo of Harry and Meghan hanging outside. Next to Meghan was a small American flag. Proudly displayed on my neighbors' fence. I came to live in this beautiful country under similar circumstances to your own. Perhaps with a little less pomp and press, but the basic story is the same. Just instead of a prince, I married a professor. It's been nearly 9 months since my arrival as a new bride in a foreign land. There are a lot of things I am still getting used to here. I still find it awe inspiring when I hear the age of some of the everyday buildings I am surrounded by. Just last week I was at a work meeting in a coffee shop across the street from a Church built in the 1300s! Before 1492 when Columbus sailed the ocean blue, people were worshipping in a building that I can just casually walk into after my coffee! I can't even imagine the awe-inspiring buildings you will be able to walk into with your royal credentials! Although our lives may be really different in grandeur and scope, I thought I'd share a few observations from my own transatlantic transplant you might find helpful. And I'm not sure what the household chores will look like when married to a prince, but sometimes here I feel a little like I'm living in the Little House on the Prairie. It's a different pace of life with a smaller environmental footprint. I'm still getting used to seeing laundry hanging out on a line in my backyard. Ron Weasley the rabbit enjoying our "garden" last fall. Which btw I should call a back garden. A yard is paved. A garden is the green behind your house. And you might grow vegetables in an allotment. Or the palace might have a vegetable patch they'll allow you to use on the grounds. But anyway. In the beginning all these small differences might start to add up to make you feel a little alien. When you have to learn 5 new things just to go the grocery store by yourself, you might start to feel overwhelmed. Or you might have servants to go shopping for you... I'm not sure how it works when you're royalty. But for me, I did find myself starting to feel frustrated with the sheer amount of small things I didn't know. Things that I might have found interesting or endearing as a tourist, made me feel foreign and incompetent as a new resident. I can't tell you how many times I've thought, "it never would have occurred to me to..." For example, I tried for days to figure out how to lock our back door before I asked my husband. You lift the handle up. Ah. It never would have occurred to me to lift the handle up! These might seem like small things to point out just after you've made such a large move. And they are. But these small things can contribute to real culture shock. And so when the honeymoon finishes, and your life begins here in earnest, and it sinks in that you've left your community, your career, and even your country- remember that you are not foreign to yourself. Everything around you will be slightly different, which might leave you feeling disorientated. Like you don't know who you are. In those moments, try to remember that you are the same person you were before- you just need to find a way to manifest that self in your new surroundings. Shortly after we moved here, my pre-teen with the rubber in her pencil case started to mourn the loss of her identity at her old school. She said everyone knew her at the old school, and here she felt like play dough that had been smushed back into the can. She'd lost her shape. Her sentiment was both heartbreaking and familiar to me. Because I knew how she felt. And hearing her put into words how I was feeling, helped me. Recently I had a 90 day review at work. My boss wrote under my strengths, "A genuinely strong desire to see others succeed before herself." And I started to cry. Right in the middle of the review. Because I hadn't been sure how people were seeing me here really. What shape I was presenting. When I read those words, I knew that somehow I had been displaying what was important to me all along. I might have been smushed into a slightly different shape, but I am still made of the same stuff. Any new life change can be hard. A new home, a new marriage, a new job. When you have all that at once and add a new country, it can be really disorientating. That's not to downplay for a minute all the wonderful things and the new opportunities and the happiness of our love stories. But I want you to know if you start to lose yourself a bit, I've been there too. And it does get better. Writing this blog today in fact is a step for me in finding my voice again. Opening back up my play dough can. Reminding me that I have always formed my best shapes through sharing with others. That's who I am. So I wish you all the best this beautiful life can offer. And if you'd like to form an American expat wives club, I will graciously offer to host. Musings of a terrestrial being.